Smash Up: The Obligatory Cthulhu Set features crazy Cthulhu cultists, fishy Innsmouth locals, horrifying Elder Things, and good old Miskatonic University members (the Fightinâ€™ Cephalopods). The four factions to be included in this set are truckers, vigilantes, disco dancers, and kung fu fighters. 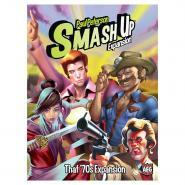 Smash Up is back after a vacation in the far east, and it brought all new factions like you have never seen before! Unless you, like, watch TV or movies, or read comics or something. But who does that? Hide under the sheets! Monsters are coming! 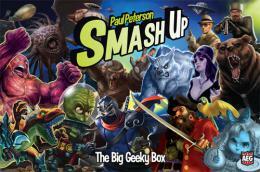 Smash Up: Monster Smash brings all the great horrors of the screen to your game of Smash Up. Can you master these horrifying factions to defeat your opponents? With new ï¿½power counterï¿½ mechanics, Monster Smash brings all-new excitement to your base smashing madness! This oversized box features three long trays for holding your Smash Up factions, as well as high quality dividers for sorting. It also comes with the really cool foam spacers that people loved in Thunderstone and Nightfall. Not only that, but the box comes with a bonus faction, the Geeks! Pretty Pretty Smash Up brings the sweetest factions ever to the vicious fight for victory! Kitty Cats use their incredible cuteness to take control of enemy minions. Princesses ply their royalty, beauty and even their love to get their way. Fairiesï¿½ fickle tricks give you options like never before, while the herds of Mythic Horses work together for dominance. Get ready: your opponents will never know what hit them! 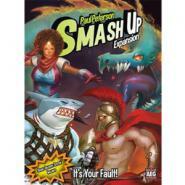 Smash Up: Its Your Fault continues the exciting fun of Smash Up with four factions chosen by the fans themselves. With direct input on the crazy decks, including Sharks and Dragons, fans of Smash Up will not want to miss this set. We are gonna totally get busted. Smash Up: Cease and Desist brings you some of the coolest new factions that are totally not anything at all like some awesome movies and TV shows that we are really into. Not at all. By combining this expansion with your Smash Up sets, will you take Zombie Rock Stars against Explorer Dinosaurs? What about Time Travelling Grannies versus Teddy Bear Vampires? It is all possible now! All your dreams can finally come true! 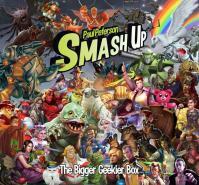 The Bigger Geekier Box was designed to hold even more sets than The Big Geeky Box. Also, unlike the Big Geeky Box, this set contains with a comprehensive rule book compiling all the rules and card clarifications from all the sets created so far.